The committee of the Joint Community Councils Dail Mhor Working Group outside the Home with Chairman James Hilder on the right. Locals campaigners were “disappointed” that health bosses failed to attend a meeting to discuss the future of a care home in the Ardnamurchan peninsula. Members of the community gathered to ensure the short-term reopening of Dail Mhor House in Strontian is sustained. The centre, which previously provided care to five residents on a full-time basis, was closed by NHS Highland in August 2017 to carry out emergency plumbing works, and remained closed. Dail Mhor House did, however, reopen last weekend, providing short-term rest bite care to patients in the area. Now a working group consisting of five local community councils has called for the centre to remain open and are pushing for additional services to be provided at the facility. James Hilder, chairman of the Combined Community Councils Working Group, said: “There is still a long way to go to get Dail Mhor open on a permanent basis. All of us on the group remain committed to seeing residential services available on the peninsulas, because it’s just too far for families to visit loved ones in Fort William or Fort Augustus. “We need to look at what other service can be delivered from Dail Mhor and using the care beds in a more flexible way. Claire Cameron, NHS Highland’s service manager for Dail Mhor and Fort William’s Invernevis House was in attendance, delivering a presentation and answering the queries of the 50 strong gathered audience. 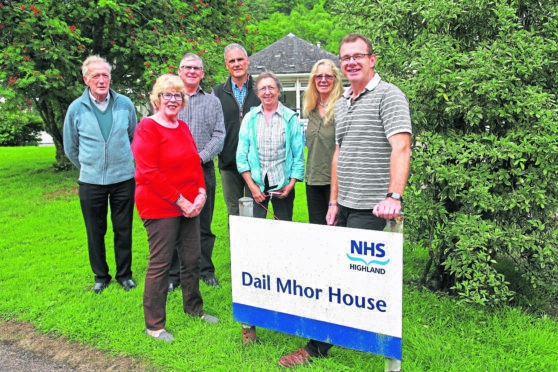 David Ogg, chairman of Acharacle Community Council, commented: “While it was disappointing that no senior managers from NHS Highland were present, Claire’s commitment to Dail Mhor was clear, and evidenced by her willingness to work night shift to serve her client base. A spokesman for NHS Highland said: “NHS Highland’s service manager for Dail Mhor and Invernevis House was in attendance.